Some things just grab your attention, like driving past a car crash. Sweden’s Carcrash Records produces the kind of arresting music that you can’t fail to prick up your ears to, with some of the most captivating bands that have taken the aftermath of punk-influenced music to a whole nuther level, like International Noise Conspiracy and Division of Laura Lee. Label founder and DoLL drummer Hakan Johansson crashed a few crazy syllables into our leaning lobes. [Hakan Johansson]SLUG: How/why/when did you start the label? Why do you have the slogan “not just music since 1996?” What else does your label provide besides just sound? HJ: I started working at a record label called No Looking Back Records in my hometown, Vänersborg, just after I finished school around ’94. Basically, just because I love music, and wanted to get a clue on how a label was run. At that point, NLB was working together with a Gothenburg-based label called Dolores Records, and Dolores had the final say in what we could release and what we could not. 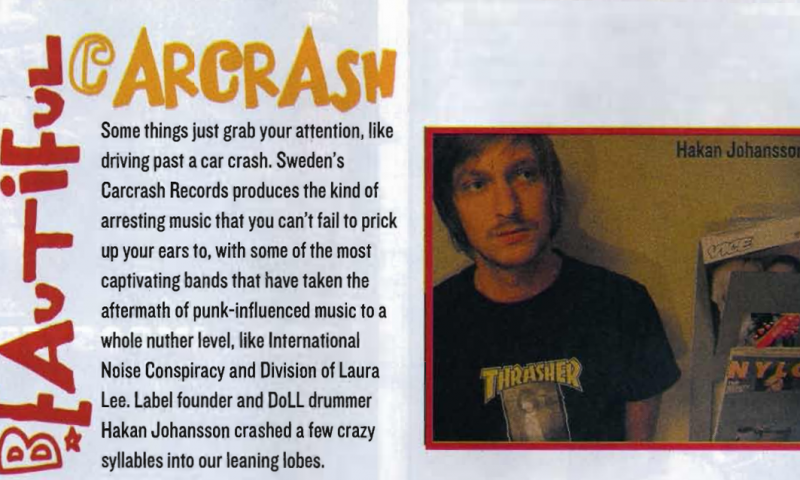 After a few years, I got sick of their way of thinking and started Carcrash Records with Mattias Foldemark in the fall of 1996, which was to be fully independent. First to be released was the debut by UNCLE (a band we were both in at that point). In 1998, NLB stopped running. Having all the NLB contacts and distribution, Carcrash took off real fast within just a couple of months. Our motto, “Not Just Music,” was, and still is, the way we see the label. It doesn’t have to be a record; we could release art, books, photography, etc. ; anything we think needs to be put out and shown to the public. SLUG: What niche in the current musical world does your label fill? How has the label grown since the beginning? Why the hell do we need another Swedish rock label? What do you add to the Scandinavian music scene; a little more art rock to the garage sound, or what? HJ: We have never tried to create a niche within the label, although something of a niche has evolved over the years. We started off with a lot of spazzcore, moved on to post-rock, and now we have a lot of instrumental bands, so I guess art rock could be a good way of putting it. We work towards being similar to a community than a record label; having a good relationship with the bands we are working with. We never write contracts with our bands. If they decide that signing with a major label is the best way for them to continue moving forward, we would respect their decision. We started out just releasing vinyl, mostly 7″s, then moved on to full-length LP s and CD s. It’s a slow growth, but enjoyable. Sweden is overfilled with great bands. I guess there is nothing to do on your free time when you’re a youth, besides sports, a 9-to-5 job, or playing music. And during the winter season, it’s dark most of the time, and what better to do then but practice with your band? For as long as we can, we will keep releasing records with great bands that a major label wouldn’t risk putting their money into. That’s why we exist. SLUG: What are the most difficult/most rewarding things about operating your label? HJ: The most difficult is often having serious difficulties with our cash flow. The problem has to do with getting distributors to pay their bills in time, as well as not being able to get credit at the pressing plants. Also, having enough time to work with the label. Being in a band such as Division of Laura Lee, when we are touring for about six months every year, makes it almost impossible to work full time on the label. The most rewarding part must be when we get the final product. When you get to see the artwork nicely packed together with the disc … I can easily sit and stare at the cover for 45 minutes while the music plays on the stereo. SLUG: What recent releases/signings are you most proud of? Regarding QGMR, is loud the new quiet? By which I mean, is there more subtlety and sophistication to be found in higher volumes? HJ: The most recent has to be C.AARME. It had been a long time since I had seen a band with such charisma and empathy. I asked them right there and then if they wanted to release something on Carcrash. And the rest is history. Their debut is now licensed from Carcrash to Burning Heart (Europe), Shock (Australia) and Epitaph in the US. I am also proud of having released three albums by Dialog Cet, which in my opinion is one of the best Swedish bands around! 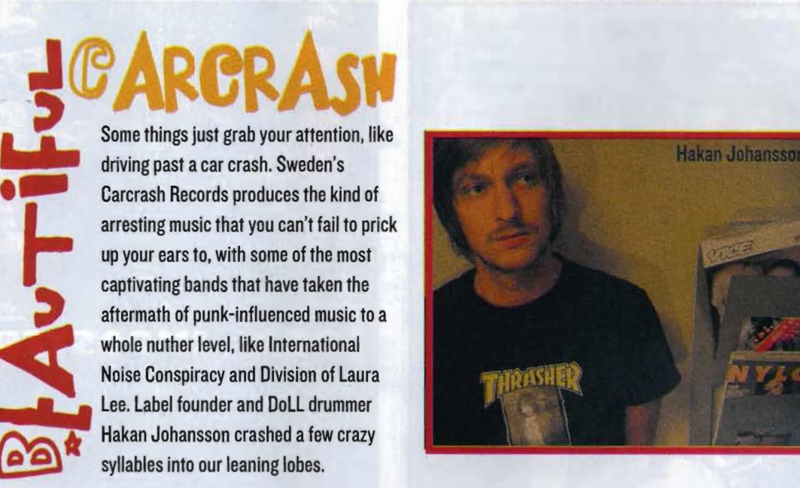 Carcrash has “a bunch of new releases and projects in the works” for 2005. They have just landed a new US distribution deal with Monsoon starting this September. Soon their new releases will be found in record stores across the country and not just on the web.